An Elegant Dress for Genesis for use in Daz Studio 4.6. Dress, Hat, Umbrella. Movement Handles included. Everything looks great. I can' t stop downloading. Thank you so much for sharing. Such attention to details. Love the artistry. Thanks again! There was a problem with flipped normals which I have now put right and updated the files. Please inform me if there are any problems, them I can put them right there and then, not over 2 years after the item was made available. Thank you. 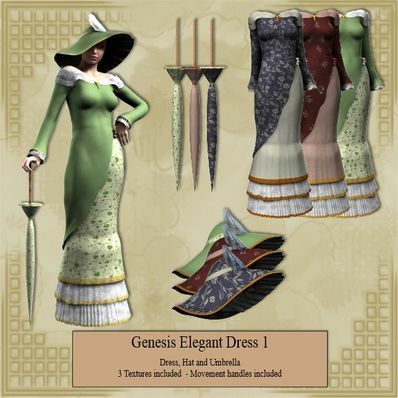 Just awesome, thank you for the wonderful textures and accessories, love that umbrella and hat! Adorable, love the umbrella! TKU!